Workstation cranes are a perfect solution to a specific task problem such as production lines or individual workstations. We define workstation cranes as interior building cranes that are designed to lift under 4000 lbs design for specific work cell functions. They can be ceiling-mounted or freestanding, with single or double girder bridges, or a monorail system. They can be customized easily in the design process using standardized parts to fit a myriad of environments and tasks. They have a larger working area than jib cranes and workstation cranes usually have powered hoists (some have manual chain hoists) for vertical lifting. Bridge systems on these cranes are typically not powered and to move the load in a horizontal plane the operator would push or pull the load manually. 100 to 1 productivity ratio (1000 lb. load only takes 10 lb. force to move). Cranes that are built for larger lifts, over 4000 lbs, are considered Overhead Cranes and usually have powered bridge and trolleys to move the heavier loads. You can read more about overhead cranes here. For all workstation cranes safe, efficient, material handling is the key elements in an Acculift designed system. For operations that require workers to make precise, repetitive movements, workstation crane systems offer an ergonomic and cost-effective option, without the architectural and engineering investments often involved when installing an overhead crane. Workstation cranes with standard profile sizes and bolt-on connections can be installed very quickly. One common problem found in existing facilities is low ceilings and many operations managers have to ask the question – will a crane fit and do the job? Can you get enough of a lift from the crane to warrant it’s installation? Usually, the answer is yes, you can get the lift you need, with some ingenuity in the design. Single and double girder low profile cranes are specifically designed to give the best solution for achieving optimal hook height in low headroom situations. Runway – the loading applied to the runway system is considered in the design. There are many options available in a situation like this and the value of custom solutions from knowledgeable equipment providers is well worth the money invested. Sometimes you need to do more to your load than simply move it from one position to another. Assembly may require tilting or rotating, of the load while being lifted. Workstation cranes with specific end effectors will add the ability to manipulate the load as needed by your operators. An example would be sheet metal handling in a brake – not only do you need to move the metal into the brake, it may need to be moved into specific positions many times and the final product will need to be moved to the next workstation. Run-out beams or telescopic bridges are a type of customization used when the reach of the bridge needs to extend beyond the area of the crane bay. The working span of a workstation crane can be quite large, filling the large portions of the facility if necessary, as shown below in this freestanding workstation crane system designed and installed by Acculift. Individual workstations are taken into account in this system with the columns acting as natural dividers between them. Depending on building and equipment obstructions the entire facility can be serviced by workstation cranes to give you maximum coverage and a versatile working space. 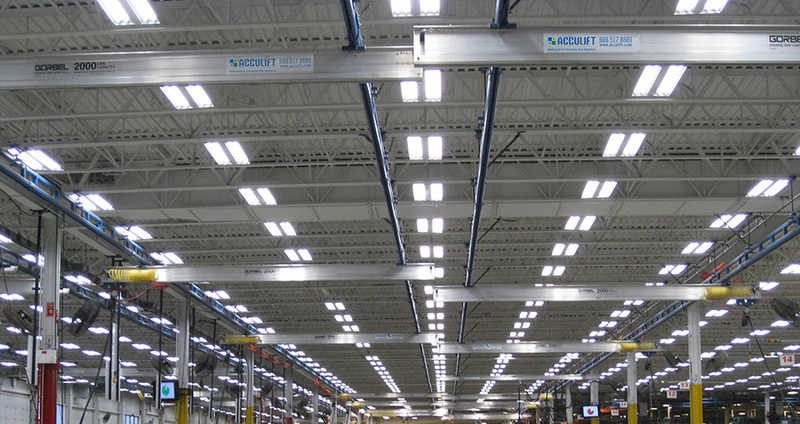 If the task requires that the material is handled and moved along an entire facility, a ceiling hung system can provide this versatility. While some buildings can’t support ceiling hung workstation cranes due to architectural and engineering limitations, when possible this is a good alternative to maximizing workable floor space and eliminating the need for supporting columns. Ceiling hung crane installations also maximize headroom in smaller facilities with lower ceilings.